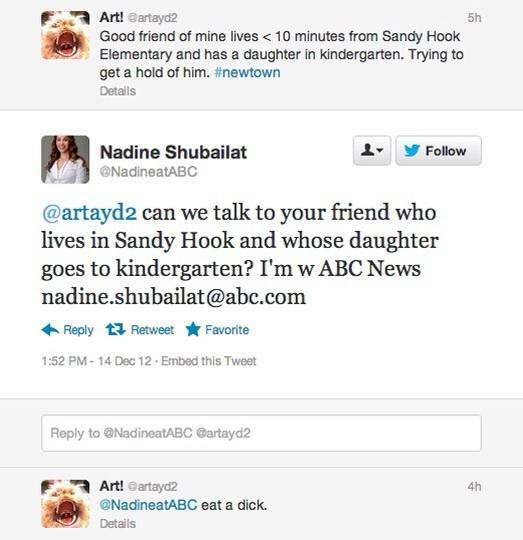 Twitter screenshot via Salon article, "ABC producer earns Internet's hate for tweeting at Newtown relatives." Is he a dot, or is he a speck? When he's underwater does he get wet? Or does the water get him instead? Is he depressed or is he a mess? Does he feel totally worthless? Who came up with person man? Modification of a GIF modified by stephen. Someone asked what was the deal with the monkey. I said: Found separated from its owners in an IKEA parking lot wearing "its favorite coat" -- its entry to the world stage was assured! While Simon Reynolds and his blog circle celebrate great moments in organic, human, philosophically pure drum solos by watching them on YouTube, back on planet Earth we are reading Marc Weidenbaum's thoughts on "rockism" and an as-yet-unreleased movie about the dying out of the traditional analogue recording studio. The fascinating thing about the trailer [for Dave Grohl's upcoming film Sound City] is that while its talking heads speak about the importance of the human element, they are at the same time surrounded by and praising technology. Just 45 seconds into the trailer, the narrative shifts from the initial survey of Sound City's remarkable discography to a single, still, geeky image of celebrated British engineer Rupert Neve. The voiceover praises the "next generation consoles" that Neve designed. Trent Reznor then lauds "the Neve sound." (A voice is heard later—it appears to be Grohl's—noting the expectation that a particular console, the Neve 8028, at Studio City would "just go straight to the Rock and Roll Hall of Fame." Grohl himself bought the 8028 from Sound City Studios last year.) The studio's origins as "tape-based" are touted. As if to make up for too much gadget talk, a remark resets the narrative: "It's a place where real men went to make records." When I asked my friends about their own technological choices, I found one friend who e-mailed but did not fax; another who faxed but did not have a phone; a friend who had a phone but no TV; someone with TV who rejected microwave ovens; another with microwaves but no clothes dryer; one with a clothes dryer who had rejected air-conditioning; one who loves his AC but refuses to get a car; a car fanatic with no CD player (only vinyl records); a guy with CDs who refuses GPS navigation; someone who embraces GPS but not credit cards; and so on. To outsiders, these abstinences are idiosyncratic and, arguably, hypocritical, but they serve the same purpose as the choices made by the Amish, which is to sculpt the cornucopia of technology to suit our personal intentions.